I have on two different occasions encountered a bug with redstone contrapsions getting stuck in weird states after quitting and logging back in. 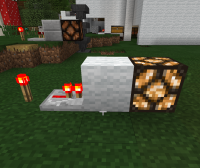 One a simple comparator powering a series of redstone dust and repeaters powering a redstone light. The other a piston door. This bug seems to affect redstone builds in a wide area. I actually have one very simple build that highlights the problem. 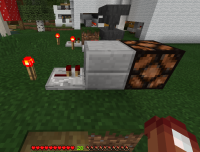 "Torch -> repeater -> block -> redstone lamp." This should power the lamp, but when the bug hits it doesnt. See the attached screenshots for a quick demo. I had one or two tickingareas that were active for the area with the redstone build. This was also on a two player Realm. I added a circular tickingarea with a radius of 4 chunks that should have covered the whole contraption. I logged on an noticed that all the redstone contrapions in a relatively wide area has stopped working. Having both players log out, then immediately log back in doesnt seem to solve the issue, however, having both players log out, wait at least 30 minutes, then have the windows 10 client log back in seems to make the stuck redstone unstuck again.